Ever wondered why with all the benefits of using solar lights, a lot of people haven’t made that investment. You hear people make comments like “What do I stand to gain by using solar lights and how will I get them charged in the absence of sunlight?” We have learned that there is a major misconception that only the sun can charge solar lights. Whilst the most effective way to charge your solar light is by using the sun, you should know that it is not the only way. Like we have said in the preceding paragraph, you can get your solar light charged regardless of whether the sun is shining or not. It might also be of shock to you that these other processes work even during winter, so you can rest assured that you will get to use your solar lights all year long. 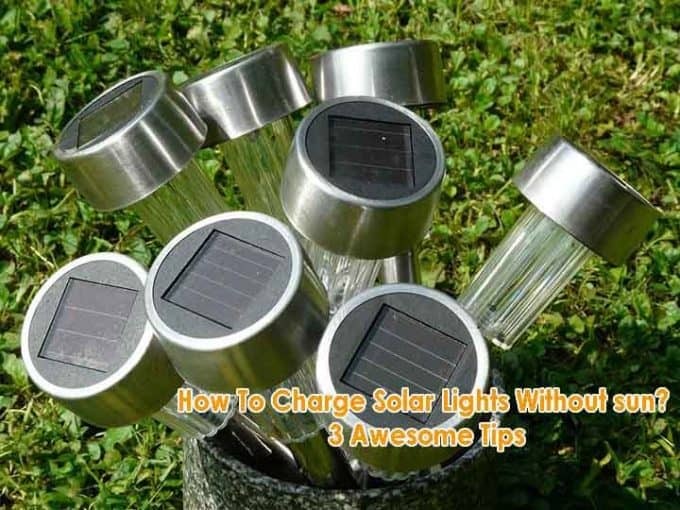 The purpose of this article is to teach you some things about solar lights and most importantly, how to charge solar lights without sun. A lot of people do not know what they can gain from using solar lights. This is why we have taken the pain to write in detail benefits which you can derive from them. To get an insight on what you stand to gain, you have to continue reading this article. People are becoming conscious of the adverse effects the type of power we use can have on our planet. As we all know, using green energy is important to preserving the planet and this is where the use of solar lights come in. By using solar light, you will not only be using clean energy, but you will also be saving the planet in the process. Solar lighting can be said to be maintenance free as you can go for years without doing any maintenance or tweaking and they will still work fine. Although, it is advisable to do quarterly cleanups during the year to keep it working at optimal level. On average, the lifespan of the batteries are seven years and you only have to get them changed after this period. Furthermore, apart from the solar panel’s glass that requires regular cleaning, all other parts of the solar lights can last for over 20 years without any routine maintenance. Installation of solar lights can be a heavy investment at first as we all know. But when you calculate the amount of money that will be paid to your electricity provider over the coming years in comparison to the installation cost of solar lights, you will see that the solar light is a smart investment. Using solar lights is safer than other types of lighting. This is because, with solar lights, you have little or no electrical wire hanging around. This ensures that you or the children around are protected from electric shock. Besides, since electric wires can sometimes spark and create fire, the lack of them makes your home safer from a fire. Solar panels are available in different designs, shapes and sizes and you have a choice to choose the one which is more aesthetically pleasing to your eye. The components of any solar light are divided into four namely; the battery, the solar panel, electronic component and the light fittings. The process of charging the batteries happens mostly during the day through the solar panels and these panels charge the batteries when the photons produced by the sun or any light hit it. Furthermore, the panel collects the rays which in turn create electricity that is stored by the battery. This process occurs through the day from sunrise to sunset and not necessarily when the sun is shining. Although, batteries of 1200 mAh can power the lights successfully but note that bigger batteries produce more power and last longer. 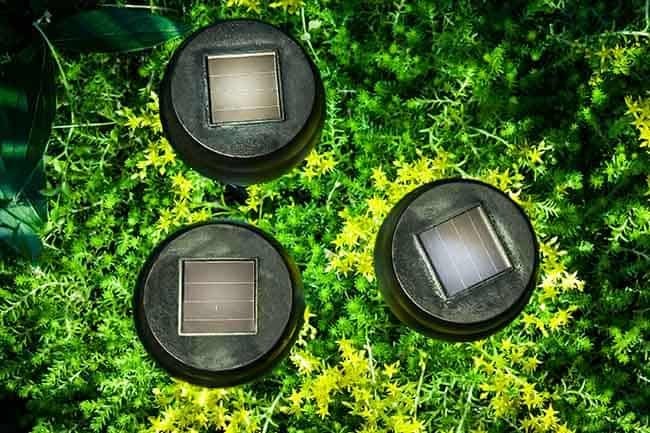 The Electronic part of the solar light known as light sensors or receptors detects if there is any light to be stored and when it is dark, it triggers the system to stop charging the batteries. The light is then turned on immediately the batteries stop charging. The light remains on till the battery is down or till the receptors detect light to charge the batteries. For a long time, people have held onto a belief that without solar lights can only get charged with the sun. This is not true because they are not designed to be charged with the sun alone. To understand the other ways to charge them, you need to read later paragraphs. The thought of having your solar lights charged on a cloudy day might sound ridiculous. This is because when we put into consideration how solar lights should work, then the clouds will definitely be in the way of recharging them. But this is untrue and you must discard the myth that only direct sunlight can charge them. The first thing you need to know is that; the position of the sun far away from the earth. And that solar panels are built with that information in mind. The Solar light is built with receptors that can receive light, stores it and convert it to energy regardless of how far away the light is. The receptors are quite sensitive that they can capture any ray of light detected by them no matter how small they are. This feature is what makes the solar light chargeable in dark, cloudy days. Rest assured that as long as the sun is still up in the sky, you will get your solar lights charged. However, you must note that the solar light will not be as charged as when they come in contact with direct sunlight. This is because the receptors will only receive a fraction of the light they would have gotten on a sunny day. This, in turn, will reduce the power you will get back from your solar lights. Incandescent light is the type of light with a wire filament that glows due to the extreme temperature from the filament. It might sound absurd that you can use this light to charge your solar light but it is true. It is even more interesting to know that this method even yields better result compared to using solar receptors during dark or cloudy days. We know what might be running through your mind already and we can say yes, it is true. It is true that solar panels need light before they can charge but as you might have guessed, it is not necessary for the light to be from the sun. The design of the solar panel receptor is in such a way that they can detect even the slightest wavelength of light. The wavelengths of the incandescent light are like that of the sun and the only difference is that the sun’s wavelength is stronger. One major advantage of using the incandescent light is; you can use it regardless of the time. You can use it during the daytime or nighttime. You can also use it in any weather be it sunny, rainy, windy or snowy, you can charge your solar lights with it and you will still get the same results. Another substitute for using the incandescent light is using the LED light. It provides almost the same wavelength as the sun and they are pretty effective. Development of solar lights has reached a level where you are spoiled for choices on the type you should choose. This makes it easier for you to choose the one that best suits your need. Below are the different types of solar lights for outdoor purposes. Solar Path Lights: These are small in size and they are not as bright compared to electric path lights. They are always placed on a stake and erected along pathways or walkways. Ambient and Decorative Solar Lights: These are exquisitely designed solar lights. They are made in beautiful colours and shapes, whilst they are not really bright; they create a beautiful view when plenty of them are used together. Solar-Powered Spotlights: These are the brightest solar lights you can get. Their brightness can measure over 35-watt of normal incandescent bulbs. They are best used at driveways or doorsteps. After taking out time to read this article, we hope you liked it and that you have learnt a few things from it. Writing this article is important to us because there is a lot of misconceptions about solar lights and solar panels in general which we want to address. We are sure that your knowledge before and after reading this article isn’t the same. We would like to hear about all your opinions in the comment section and we will try our best to reply any questions you might have. Finally, do not forget to share this article with others as we will like more people to be well informed about solar lights.